Hey PPGs! We hope you enjoyed out Guide to LA pt.1 that detailed our shopping expeditions! In pt. 2 we’re dishing on our favorite hangouts and places for fun activities while in Los Angeles! Of course, we were only in town for 4 days, so we weren’t able to indulge in EVERYTHING the city had to offer, but we quite enjoyed the following list! We were lucky enough to be staying just only flight of stairs away from one of LA’s hottest hangouts, Commissary at The LINE Hotel. 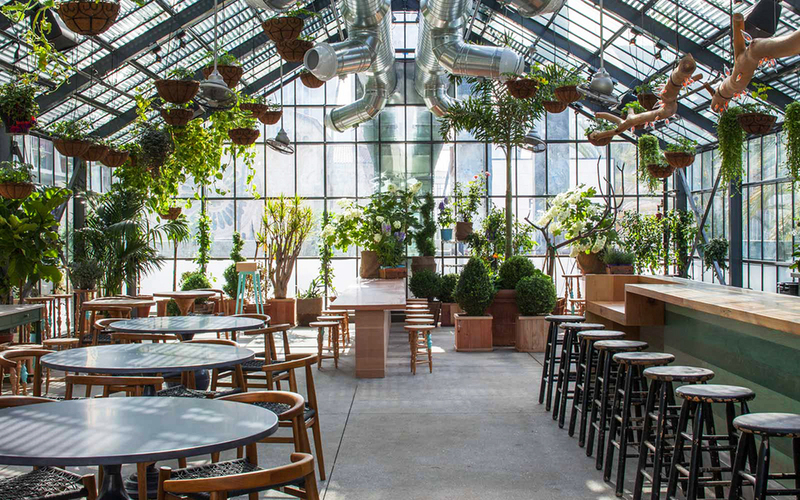 The Commissary is an indoor/outdoor greenhouse restaurant with nothing less than spectacular views and tasty eats. 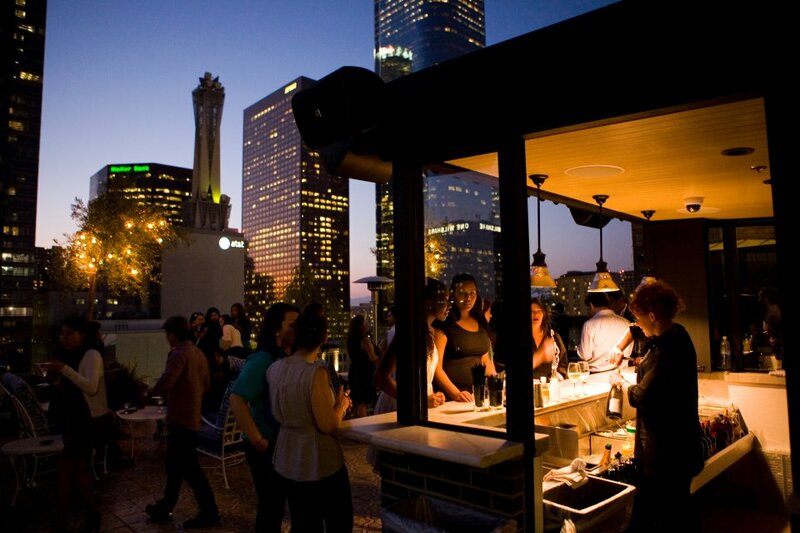 Whether grabbing a bite after relaxing by the hotel pool or indulging in a late-night hangout with the Koreatown skyline in view, we recommend Commissary for a unique rooftop experience. We LOVE hanging out at the rooftop bar at the Ace Hotel in New Orleans, so we figured the DTLA location couldn’t be any less amazing. And we were right. LA nights are much cooler than what we’re used to here in Southern Louisiana, so we appreciated the roof heaters. If those didn’t warm us enough, the kindled fireplace and strong cocktails sure did the trick in keeping us toasty while viewing the downtown nightlife from above. We visited this rooftop on our last night in town, and ended it with a bang, with our traditional “freestyle battle” on top of the vibey beats provided by the hotel DJ. While there was no clear “winner” of the battle, Ashley O. had some surprisingly mad rhymes that officially inducted her into the PPG gang. We woke up as early as our alarms & bodies would allow on Saturday morning to set out and conquer the ever-popular Runyon Canyon. All our friends’ and the countless celebrities’ photos we’d seen of this West Hollywood hike made this feat seem super easy and enjoyable. While the sights and sun were extraordinarily gorgeous, Runyon Canyon is no joke. For four girls visiting from the South with below sea level altitudes, Runyon was every bit of challenging and breathtaking…but WORTH IT. We felt all the bit of accomplished and athletic upon completion. We were able to spot the Hollywood sign off in the distance at one of the hike’s open peaks, and were even asked to take a blind taste test of a chia seed fruit cup at one the stopping points on the trail. Overall, we had a great time and were left in dire need of a shower and food immediately after our uber ride back to the hotel. Runyon Canyon is a definite repeat experience on our list for our next visit! Perch is the very manifestation of LA nightlife. We were able to gain entry to the stoic building rather quickly despite the long lines during the Mayweather v. McGregor fight night shenanigans. Once inside, you have to tackle two rickety elevators to access the first level of the restaurant and balcony. Another security line leads you to the open-air rooftop bar, where you have a 360 view of Downtown LA. All the locals we spoke to (namely our swanky uber drivers) recommended this hangout and they definitely didn’t steer us wrong.. get it, steer?! We stumbled upon this chic, modern and BRAND NEW nail bar by accident after dinner one night. The luxury upholstered furniture and overall gorgeous interior caught our eye so much that we were goose necking a triple-take through the glass panes. Finally, one of the techs let us in to get a better look, despite it technically being after hours. Turns out, Powderwas gearing up for their soft opening the very next day! And…wait for it… the owner is from Louisiana! After swapping stories of LSU & Southern and realizing we had some mutual friends back home, we loved this beautiful nail shop even more! We vowed to get mani pedis exclusively at Powder the next time we were in town. If you’re ever privileged enough to be able to afford a night at this hotel, INVITE US. If you’re lucky enough to get invited to a private, rooftop party like we happened to…again, INVITE US! This entertainment experience was the most unplanned of all our adventures while in LA. The Valley eyeglasses Raina bought in a shop on Melrose lent us the extension to an invite-only musical performance featuring burlesque dancers and world-renowned singer, Toledo Diamond. This venuedisallows any photography (cell phone or otherwise), but we were able to sneak a few audio videos on our Snapchat stories – if you missed them, we’re so sorry you missed out! The actual performance room was welcomingly cramped with only about 30 guests, which made us feel all the more exclusive for being invited. The music was captivating and one-of-a-kind, while the dancers were classy, mystical and intriguing. We didn’t leave the venue until the wee hours of the morning, but had an unforgettable story to accompany us back home. We obviously plan to make LA an annual (if not more frequent) stop on our travel rotation, and would love to hear your favorite places to grab a drink, get your nails, done, & explore! Comment below if you’ve been to any of the above locations or if you have recommendations for our next visit! Guide to LA pt.1 SHOPPING!